Today, options on the Nifty alone account for more than 80% of the total volumes on the NSE on a daily basis. Nifty options have emerged as the most liquid trading contract on the NSE. Today, options on the Nifty alone account for more than 80% of the total volumes on the NSE on a daily basis. This volume becomes higher as the expiry for the month approaches. Let us first spend a moment on the idea of a Nifty option. What is a Nifty call option all about? A Nifty call option is the right to buy (without an obligation to buy) the Nifty (the underlying) at a fixed price and on a fixed date (F&O expiry). F&O contracts expire on the last Thursday of every month, and Nifty contracts of the next 3 months are traded quite actively. Like in case of other shares, the Nifty also has a fixed lot size, which is equal to 75 units of Nifty at this point of time. 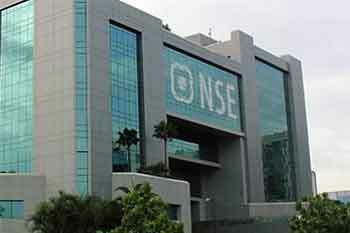 With the spot Nifty at 10,477, the rupee value of one lot of Nifty is Rs7,85,775. 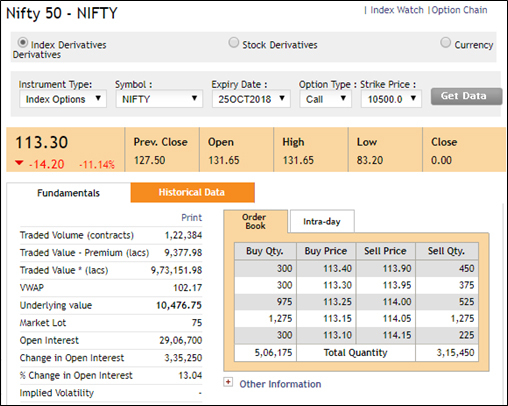 Check out the screenshot below to get an idea about the live data of a Nifty 10,500 call option (right to buy) expiring on the last Thursday of October. Brokerage cost is what you pay the broker. Normally brokerage is charged on Nifty options on a per lot basis. Let us assume a cost of Rs5 per lot, which is the norm. Securities Transaction Tax (STT) is payable on the sell side of the option (not on the buy leg) at the rate of 0.05% on the premium value of the transaction. In addition, the NSE imposes transaction charges at 0.05% of the premium value and clearing charges at 0.002% of the premium value of the transaction. Goods and services tax (GST) is charged at 18% on the (brokerage + transaction charge) and is paid to the government. SEBI charges are payable at the rate of Rs15/crore of volume traded. Here, the premium volumes are considered and not the notional volumes. Stamp Duty is payable to the state government, and these rates vary from state to state. The rate of stamp duty applicable to the state of Maharashtra is 0.002%. All these costs are mentioned in the contract note, and it is after factoring in all these costs that the net profit of the option transaction is calculated. Let us assume that a Nifty trader buys 10 lots of Nifty at Rs50 and books profits by selling these 10 lots by evening because the option price went up to Rs80. Because 1 lot of Nifty consists of 75 units, 10 lots of Nifty will consist of 750 units of Nifty. Let us look at how the detailed cost and net profit calculation is done. As can be seen from the above illustration, the cost analysis of the option trade is useful in evaluating the break-even point of the trade. What do we understand by the break-even point of the trade? It is the point at which the trade becomes profitable. In the above illustration, we are moving a total of 10 lots of Nifty on the buy side and 10 lots on the sell side. These 10 lots are equivalent to 750 units of the Nifty, and hence, the total allocated cost of Rs209.93 translates into a break-even level of Rs0.28 (209.93/750). What does a break-even of Rs0.28 really mean? It means that if you are long on Nifty 10,500 call option at a price of Rs50, you are profitable if the Nifty moves above Rs50.28. Conversely, if you are short on the Nifty option, the price has to go below Rs49.72 for your trade to be profitable. Normally, the actual breakeven is set at a higher level to provide for other exigencies such as volatility, liquidity risk, and miscellaneous costs. Profit and loss on options are treated as regular business income or as capital gains. Unlike intraday trading profits, these are not treated as speculative income. You have the choice to either file options income as part of your business income or as part of your capital gains. Both are acceptable subject to trading volume conditions. The idea is to maintain consistency. Once you adopt a method of recording transactions (business income or capital gains), you must consistently maintain that methodology.